For our new installation box series we have talked to electricians about their needs to adapt the box to real installation requirements. And this is our solution. 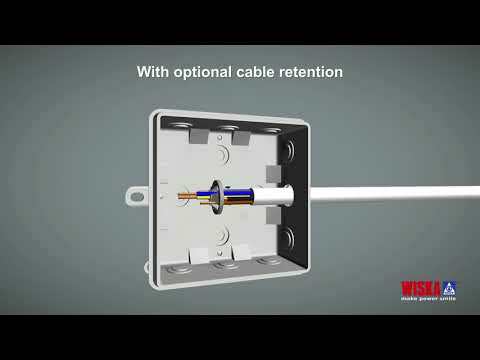 Connection-happy: The new WISKA installation box convinces with its versatile mounting options. Sticks together: Two types of plastic are used in the KA series making for a very tight hold. The lid made from a more solid plastic (PP) sticks tight onto the base made of a softer plastic (PE). Nothing will get lost here: The lid can be attached to the box so that it cannot be lost or fall down. Fixture with cable ties. Conveniently placed all around the rear side. Fixing elements to use e.g. on cable tracks. Classic fixture by screws and dowels. The lid can be attached to the box so that it cannot be lost or fall down. The entries of the KA Series are adapted for using M 20 installation conduits so that it can be place directly onto the box. The ESV can be used for intallations at the cable track with 6 mm holes. The EDV are suitable for installations at the long holes of the cable track. The ESD 30 are suitable for installations at the wall without any screws. Our cable retention clamp is quick and easy to use, helping to secure your cables safely.